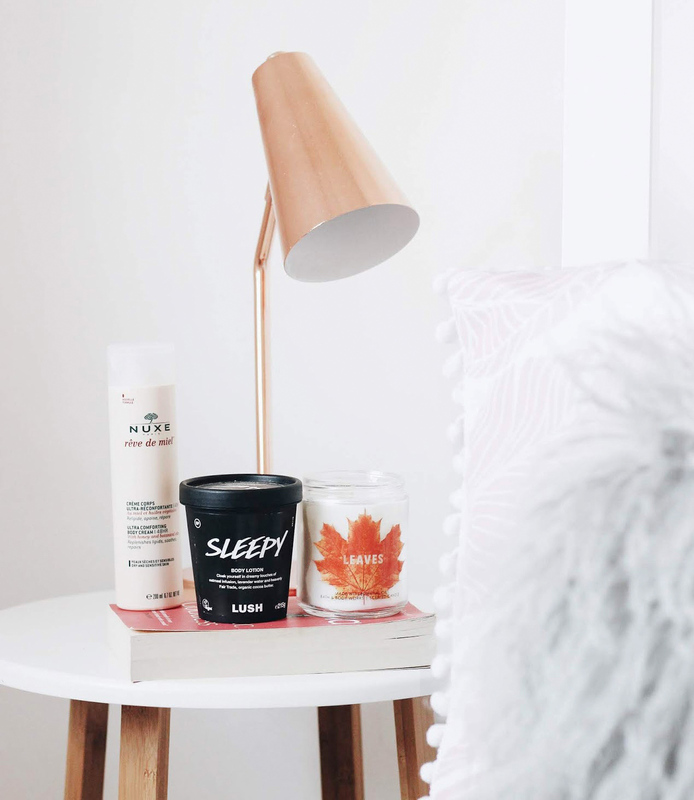 Whenever I'm feeling under the weather or in need of some TLC, I always like to have a bit of a pamper night, making time for a face mask and a long hot bath with candles, but that isn't where I usually stop. I like making a night of it, starting from washing my hair to fake tanning my body then popping on my favourite TV series or film to perk me up and make me feel better. I start off with a hot bath with all the trimmings, the perfect time to exfoliate all over, wash my locks and shave too. Of course having a luxe shower gel is always a perk and I've been trying out the new Molton Brown Suede Orris* offering which leaves me feel super clean and smelling delicious too. I've also been using up the last of my St Moriz Skin Primer* tube at the moment which helps prep my skin for tanning and gets rid of any dry patches too. For hair, I'm currently alternating between a few, but it's the Maui Moisture Revive and Hydrating Shampoo* that I've reached for quite a lot as it's a nourishing addition to my routine - perfect for Winter and the traditional season. Next up I like to give myself an even layer of the Isle of Paradise Tanning Water. This re-discovery of mine offers an even, golden tan that lasts for over a week on me and isn't too overpowering when it comes to the biscuit scent that usual fake tanners deliver. I don't like to follow up with any moisturiser until a few hours after as I don't like to disrupt the tan too much and for me, I don't like applying any body lotion before tanning as I find it's too slippery. As I said, a pamper routine for me isn't just about the products and skincare, but about making a full night of it. Getting the snacks in and popping on a funny flick or TV show. I'm currently watching the fourth series of Plebs and the newest episodes of Derry Girls both of which are worth a watch, but I've got to admit I love a Marvel film too. It's the perfect time to pop on a face mask too and I've just started trying out the Pixi GLOW Sheet Mask* which from first impression is ulra-brightening and makes the skin feel soft. How do you like to pamper yourself and relax?